What else do we know? A forthcoming article by Dr Rosie Hornbuckle examining the facilitation of inter-disciplinary collaboration, based upon her T2C paper ‘What else do we know?’, is soon to be published in the Journal of Textile Design Research & Practice. Here Rosie breaks down her key findings from the research. The most obvious reason to include designers in a project like Trash-2-Cash, where the aim is to develop a new fibre, is so they can use their product design and their experience to show scientists what they would like the new materials to be like. But in the workshops I noticed that designers were actually performing a number of important roles other than designing products, that were supporting the project work in different ways. The first thing I saw early on in the project was that designers were asking questions you wouldn’t normally associate with fashion and textiles, like ‘could this material be useful for migration?’, ‘how would this perform as a recyclable healthcare garment?’ or ‘how would this affect levels of ocean plastic?’. Bringing ideas about social and environmental issues into the discussion was an interesting and unexpected influence of the design team. Designers are usually great communicators and on a project where each person is from a different country, or has a different work background; communication is an incredibly useful skill. What I observed was that some designers, particularly the materials specialists, were very good at explaining design stuff to scientists and getting scientists to stop and explain their stuff for designers when it got too complicated. This was so useful that the project could have done with more people with those skills. These people were also great at grabbing a material to help a designer and a scientist explain something to one another, like ‘how soft?’, ‘this soft?’. Designers are great at finding ways to get other people to contribute their ideas; they have a tool for almost everything. Some of the design tools used in Trash-2-Cash were a bit baffling for scientists – they were too designy, too abstract, and difficult to understand what they were for. While other tools seemed to work really well, especially when there was a clear purpose, like the capability map (image below) which helped people to show where their knowledge fitted within the project. The great thing that we discovered was that designers have a lot more to offer this type of project – where lots of different specialists work together – than just designing products, they can actually support the teamwork as well as potentially take it in different directions than would have been possible if scientists or manufacturers were working alone. This is good, because this is how innovation happens, by stepping outside of traditional ways of working and trying something new, and designers have an even more valuable part to play than many thought before this project began. Rosie's paper 'What Else Do We Know? Exploring the application of design knowledge and skills for the circular economy beyond materials selection and design for production' can be read in full here. 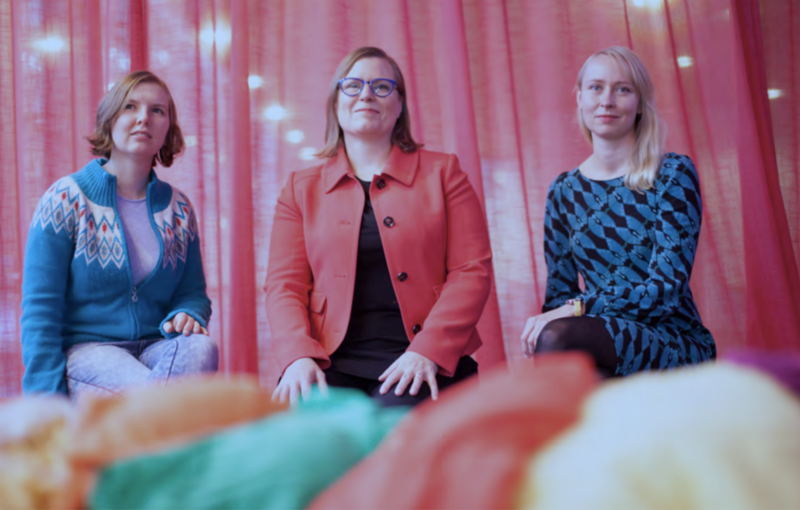 Three of Trash-2-Cash’s key academic researchers, Associate Prof. Kirsi Niinimäki of Aalto University, Finland, Prof. Rebecca Earley and Dr Kate Goldsworthy of UAL, London, have been invited to present papers at the 2nd PLATE Conference to be held at the Faculty of Industrial Design Engineering of TU Delft, The Netherlands, November 8 –10, 2017. PLATE is an international conference on Product Lifetimes and the Environment which Prof. Tim Cooper of Nottingham Trent University set up in 2015. He understood that moving to a more circular economy and increasing product longevity are key areas to explore in relation to a sustainable future. Rebecca Earley and Kate Goldsworthy, co-directors of the Centre for Circular Design (CCD), are presenting a paper entitled, Playing for Time: seven practice-led workshop tools for making design decisions to extend the life of fashion textile materials and products as part of Mistra Future Fashion research. The academic duo, throughout their careers have transferred practice into theory and vice versa in the field of sustainable textiles. The paper presents 7 inventive design tools to support fashion textile designers from a variety of backgrounds to extend the life of a garment. The tools range from design strategy cards through to lifecycle assessment approaches which include the use of metaphorical Speeding Tickets. These playful and creative methods are designed to enable the development of a design concept on paper for a product with an extended life. The subject of slow fashion and long life is further discussed by the keynote speaker Kirsi Niinimäki in her paper entitled, Fast or slow? Fashion lifecycles in a circular economy context. Kirsi will be talking in depth about the differing methodological approaches and systems thinking in relation to fashion speeds. Her research focuses on a holistic understanding of sustainable fashion and textile fields and connections between design, manufacturing, business models and consumption. The fashion/textile research group that she heads at Aalto University is involved in several significant research projects, which integrate closed loop, bio economy and circular economy approaches in fashion and textile systems. Both papers reveal an immense depth of knowledge and creative inventiveness that have the potential to have a real impact on the future of sustainable textiles. Finland, with its densely rich forests and scattered islands, provided the perfect backdrop to workshop 09 in its capital, Helsinki. Hosted by Aalto University over a period of three days, workshop 09 was based at The Design Museum in the historic centre and at Espoo, a stunning tree covered campus. Day 1 of Workshop 09 was centred around the academic partners meeting to discuss the ‘Master cases’ – concepts shortlisted from 33 ideas to 7 - covering fashion, new generation plastics and automotive interiors. Environmental impact, LCA, innovation, realistic business models and feasibility all had to be considered in great depth before arriving at these decisions. The main purpose of the workshop as a whole was to decide how to turn these cases into successful design products and prototypes. The day began with an overview of the whole project along with thorough presentations of the 7 master cases. This was followed by interactive and discussion sessions to assess how to move each case forward. Honest and difficult conversations were had, essential to innovation success. To break from the intensity of the day a tour of the design museum was given with particular reference to the ‘Enter and Encounter’ exhibition, featuring work from Aalto University’s New Biomateriality Lab and referencing Trash-2-Cash work. On day 2 the consortium was very much ‘Lost in the Wood (s)’ on a cold misty morning at the green leafy Aalto University campus in Espoo, where Aalto Chem are based. Surrounded by nature and spending most of the day in what looked like a luxury tree house, all technical aspects of the project were analysed. Manufacturing streams, recycling and business scenarios were all debated and discussed at length and processes put in place to move towards fully-formed prototypes. Existing and potential challenges were also addressed. A tour of the Aalto Chem laboratories provided a fascinating insight into regenerated cellulose processing. It was inspiring for everyone to be in a scientific environment free of harmful chemicals and that focussed on circular innovation. The highlight of the day was to see the results of new Trash-2-Cash yarn and fabric developments. Despite the challenges ahead and technical aspects still to resolve, excitement was in the air as the consortium could see the potential and positive impact final realised prototypes and product designs will have on the environment and on industry. At this important turning point fully formed products can now begin to emerge. Watch this space! Trash-2-Cash’s Becky Earley (UAL) presented the Silence Shirts project - a collaborative research methodology experiment undertaken during T2C workshops - at the INTERSECTIONS 2017 conference exploring collaboration in textile design research. The Silence Shirts project demonstrates how the activities of silent meditation and portraiture were employed as effective tools in the establishment and development of the relationships between the designers, scientists and industry participants collaborating on the T2C research project. Silence Shirts aimed to navigate issues that can be barriers to effective collaboration, such as language, culture and competence, by establishing a shared ‘baseline experience’ as a foundation from which the collaborations could be fostered. A conference paper - titled ‘A meditation on the faces of circular textile research’ - co-authored with Rosie Hornbuckle (UAL) presented three experiments conducted to provoke new insights into the roles, knowledge and expertise of the members of the group which resulted in the project’s first co-created garment, the Silence Shirt, featuring a print design by Professor Earley collaged from the portraits painted by members of the project team. Organised by the Textile Design Research Group at Loughborough University and held at the University’s London campus on 13 September 2017, the one-day conference examined case studies that reveal unusual connections and cross- or interdisciplinary collaborations in research in the fields of textile and textile design. The conference was accompanied by an exhibition of the work that emerged through the collaborations, including the Silence Shirt. The Silence Shirt was also featured in the 2017 Biennial of Design in Ljubljana - BIO25 - as part of the ninth edition of Shirtings, a socially responsive initiative that offers unique shirts by Slovenian and London-based designers as ‘social-objects’ to be the 'responsibility' of a user for 10 days before being passed on to the next participant. In the latest T2C podcast, Professor Becky Earley catches Cansu Musaoğlu, head of the dyeing department at Turkish textile producer and T2C partner Söktaş, just before she departs for her new position at a private university in Istanbul. Recorded upon the conclusion of T2C Workshop 8 in Bilbao, Spain, Becky and Cansu discuss the drivers of sustainability for Söktaş, the importance of sustainability to their customers and how Design Driven Material Innovation (DDMI) has given Söktaş’ R&D department a completely new perspective and approach. Söktaş is a fully integrated producer of cotton and cotton-blended fabrics for shirts, jackets and trousers, supplying many of the world’s leading fashion labels. As T2C partner Söktaş are key in the supply of cotton to textile waste, research on recycling products, fabric production from recycled yarn, laboratory testing and the production of prototypes. Listen on Soundcloud or iTunes now! T2C partner and host of the next T2C workshop in Helsinki, Aalto Arts are celebrating the launch of a new biomaterial-focused publication Lost in the Wood(s), a new Biomateriality in Finland with a seminar event at Design Museum Helsinki next month. Taking place September 19th, the seminar agenda includes a series of talks by T2C partners, including: Presenting the Trash-2-Cash project by Emma Östmark, Director of Sustainable Textile Fibres at the RISE Research Institute of Sweden; Interdisciplinary collaboration for material innovation by Christian Tubito, Project Manager of Research & Innovation at Material Connexion Italy; Waste-free future of the fashion industry - the chemistry behind it by Michael Hummel, Staff Scientist at Aalto University School of Chemical Engineering; and The need of improvements in textile sorting of garments for textile-to-textile recycling by Helena Wedin, Researcher at RISE Research Institutes of Sweden. The second part of the event presents the new Aalto ARTS Books publication Lost in the Wood(s), edited by Pirjo Kääriäinen and Liisa Tervinen. Through inspiring case studies (including the T2C project) and stories from researchers working intimately with biomaterials, the book explores how Finland’s natural resource – renewable biomaterials, such as cellulose – could replace oil-based resources and create new business and service models through design and collaboration. The seminar and book launch coincide with the current Biomateriality Lab installation, part of Design Museum Helsinki's Enter and Encounter exhibition, exploring new, primarily wood-based, Finish biomaterials developed through multidisciplinary research projects at Aalto University. The exhibition is open until 22nd October 2017. Buy the book from the Aalto Arts online shop. Matcomp provides a forum for the presentation and discussion of R&D led projects in the field of composites and high performance materials. The display was presented as part of the “Recycling and sustainability” themed session and highlighted how reinforced plastics can find applications in untapped industry sectors, through design driven technologies in a circular economy. From a technical perspective, the poster explained the production of recyclable thermoset composites made with fabrics obtained from waste textiles and epoxy or polyurethane resins. The visuals also addressed the process of how fibre and resin can be recovered for reuse. The project was extremely well received and Cidetec continue with their research innovations for Trash 2 Cash. At the end of May T2C researcher Professor Rebecca Earley attended the Autex International Textiles conference 2017, themed 'Shaping the Future of Textiles'. The venue was in sunny Corfu, where 412 delegates met over three days to see 309 papers and 118 posters. Rebecca presented a paper written with Dr Rosie Hornbuckle which explored the use of the simple postcard as a communication tool within the project; 'Postcards from the Edge: Trash-2-Cash communication tools used to support inter-disciplinary work towards a Design Driven Material Innovation (DDMI) methodology'. In this paper, postcards from the EU funded Horizon 2020 Trash-2-Cash (2015-2018) project - completed by workshop participants – were presented in three tables with a focus on how they contributed to the building of communication channels, shared understanding and methods, in this inter-disciplinary consortium work. This inter-disciplanarity is key to achieving the project aims – but communication between sectors is challenging due to diverse expertise and levels of experience; language and cultural differences can also be barriers to collaboration as well. Designing easy and accessible, even fun, communication tools are one of the ways to help build relationships. The cards reviewed were used in Prato (November 2015), Helsinki (February 2016) and London (November 2016). The paper concluded with insights for the ongoing development of the project communications work towards the Design Driven Material Innovation (DDMI) methodology, due to be presented at the end of the project in 2018. Conference proceedings will be published in due course; for more information go to the Autex website. Between 4-9 April 2017 Material Connexion Italia (MCI) presented the work of Trash-2-Cash at the Milan Design Fair. This year’s “Materials Village” focused on the theme “New Materials for a Smart City” [with the patronage of the Municipality of Milan] and featured a dedicated booth for T2C including the first material samples to emerge from the project. The Materials Village was hosted at Superstudio Più, one of the most renowned locations of Fuorisalone [the design fair that takes place on the same days as the Salone Internazionale del Mobile]. This year more than 130,000 visitors came through the Superstudio Più, a mix of design professionals, and the design-oriented public. The “New Materials for a Smart City” exhibition also included a podium space where discussions and presentations related to innovation and smart manufacturing were held on a daily basis with over 1,000 participants. As the T2C booth was at the entrance to this area it was well-visited and attracted a good response from groups of people who will be interested in the eventual outcomes of our research. Check out an album of photos from the event on the T2C Facebook page. T2C partners Aalto Chem presented their research earlier this month at a meeting of the American Chemical Society (ACS). You can see the full press conference with Simone Haslinger and Dr Michael Hummel on YouTube, or read on for the ACS account of the event. SAN FRANCISCO, April 2, 2017 — Pollution created by making and dyeing clothes has pitted the fashion industry and environmentalists against each other. Now, the advent of “fast fashion” — trendy clothing affordable enough to be disposable — has strained that relationship even more. But what if we could recycle clothes like we recycle paper, or even upcycle them? Scientists report today new progress toward that goal. The team will present the work at the 253rd National Meeting & Exposition of the American Chemical Society (ACS). ACS, the world’s largest scientific society, is holding the meeting here through Thursday. It features more than 14,000 presentations on a wide range of science topics. All these reasons amount to a big incentive to recycle clothing, and some efforts are already underway, such as take-back programs. But even industry representatives admit in news reports that only a small percentage gets recycled. Other initiatives shred used clothing and incorporate the fibers into carpets or other products. But Haslinger, a doctoral candidate at Aalto University in Finland, notes that this approach isn’t ideal since the carpets will ultimately end up in landfills, too. A better strategy, says Herbert Sixta, Ph.D., who heads the biorefineries research group at Aalto University, is to upcycle worn-out garments: “We want to not only recycle garments, but we want to really produce the best possible textiles, so that recycled fibers are even better than native fibers.” But achieving this goal isn’t simple. Cotton and other fibers are often blended with polyester in fabrics such as “cotton-polyester blends,” which complicates processing. Previous research showed that many ionic liquids can dissolve cellulose. But the resulting material couldn’t then be re-used to make new fibers. Then about five years ago, Sixta’s team found an ionic liquid — 1,5-diazabicyclo[4.3.0]non-5-ene acetate — that could dissolve cellulose from wood pulp, producing a material that could be spun into fibers. Later testing showed that these fibers are stronger than commercially available viscose and feel similar to lyocell. Lyocell is also known by the brand name Tencel, which is a fiber favored by eco-conscious designers because it’s made of wood pulp. Building on this process, the researchers wanted to see if they could apply the same ionic liquid to cotton-polyester blends. In this case, the different properties of polyester and cellulose worked in their favor, Haslinger says. They were able to dissolve the cotton into a cellulose solution without affecting the polyester. To move their method closer to commercialization, Sixta’s team is testing whether the recovered polyester can also be spun back into usable fibers. In addition, the researchers are working to scale up the whole process and are investigating how to reuse dyes from discarded clothing. The researchers received funding support from the European Union’s Trash-2-Cash project and the Finnish government. This press release was originally published by the American Chemical Society. The American Chemical Society is a nonprofit organization chartered by the U.S. Congress. With nearly 157,000 members, ACS is the world’s largest scientific society and a global leader in providing access to chemistry-related research through its multiple databases, peer-reviewed journals and scientific conferences. ACS does not conduct research, but publishes and publicizes peer-reviewed scientific studies. Its main offices are in Washington, D.C., and Columbus, Ohio. Last year a team from Finland (including T2C partners Aalto University and VTT, alongside University of Helsinki) won the Global Change Award (GCA), an annual innovation challenge organised by the H&M foundation*. Their entry was to ‘Make waste cotton new’ using Ioncell-F technology. Since last year’s award, Aalto University has been prototyping various knit structures using Ioncell-F yarns, and at this year’s awards Pirjo Kääriäinen from Aalto’s GCA winning team and Essi Karell from T2C have exhibited a garment prototype to demonstrate how far they’ve come in 12 months. The prototype is a translucent ivory coloured top with delicate frilled detailing. The fabric resembles linen, with the softness of cotton. The top is constructed with a combination of hand and machine stitching. and, most importantly, to collaborate and challenge the existing practices together. *More about H&M Global Change Award and the winners here. A €1 million grant is shared by five winners that show potential to shape the fashion industry and to help protect the planet. This year the grant was divided according to the public's votes at Stockholm City Hall, 4 April 2017. In the latest T2C podcast, researcher Gustav Sandin explains how the Lifecycle Assessment tool can be used to determine the impact of everyday products like jeans or hospital gowns, services like clothing libraries, or processes like the washing of clothes. It’s about understanding the entire context of the product or service, not just the materials they’re made from. Gustav’s work identifies where the hot spots are, and how these might be managed out to make a real and measurable difference. Gustav (from RISE - Research Institutes of Sweden) describes how modelling garment lifecycles is a kind of environmental mythbusting, and how passionate he personally feels about achieving a significant reduction in environmental impact through the research projects he is involved in. Exploring Design-Science Material Innovation Partnerships. Materials research has developed rapidly in recent years, in both the scientific field and through design exploration. Design-science collaborations are emerging which create new directions and conversations in materials development. Outlooks and mindsets are changing through these collaborations to challenge traditional approaches and established disciplinary boundaries. The aim of this one-day seminar was to explore new ways of thinking by inviting existing design and science collaborators to present their work together, from their own unique perspectives. Dynamic Duos was curated within the context of the Trash-2-Cash (T2C) project which aims to apply a ‘design-driven’ approach to the development of new, regenerated textile fibres. The day started with an introduction from Professor Rebecca Earley and Dr Kate Goldsworthy from the Textile Environment Design (TED) research group based at Chelsea College of Arts (UAL) who hosted the event in London. Becky presented a showcase of past and present projects where UAL design researchers from the Textiles Futures Research Centre (TFRC) and at the London College of Fashion have worked with scientists, including the work of Suzanne Lee, Carole Collet and Helen Storey. Current TED projects such as Trash-2-Cash and Mistra Future Fashion II continue this research direction by bringing together large multi-disciplinary teams to try to tackle the complex problems of materials cirularlity and sustainability. This has allowed TED to build a team of Post-doctoral Researchers – Dr Dawn Ellams and Dr Rosie Hornbuckle, and PhD students who are working in this field. Kate explained, the team’s experiences have resulted in some interesting insights about how designers and scientists can work together, such as ‘bringing our studio with us’, revealing hidden (technical) knowledge through visualisation, ‘bypassing the system’, using co-design workshops, and tacit materials knowledge or ‘design hunches’. How did the collaboration start? What were the main challenges? What helped you to communicate and share knowledge? What was ‘success’ for each of you? As well as some fantastic speakers it was great to have both scientists and designers in the audience, from both academia and industry, representing other EU projects such as Light Touch Matters and ECAP, and UK organisations such as WRAP and the AHRC – a truly informed audience. The day was organised so that the dynamic duo presentations in the morning generated the content for further round table discussions in the afternoon. Marjaana Tanttu and Dr Michael Hummel from Aalto University in Helsinki kicked off with a brilliant anecdote about ‘Dog Brushes’. In order to bridge the gap between fibre production and textile prototype they had to solve some very practical problems in an immediate way – separating the fibres using dog brushes and cutting staple fibres using paper scissors. This highlighted a problem that was shared in the room, that often lab-scale equipment is insufficient to produce prototype-ready materials for designers to use in their work. The need to work closely together and share spaces was also a key element in enabling a common language to be developed, and the use of summer schools to create an interdisciplinary ‘playground’ was a theme which resonated in subsequent talks. Prof Kay Politowicz (UAL) and Dr Hjalmar Granberg’s (RISE) talk began with how they started to work together, as an off-shoot of the Mistra Future Fashion project; they didn’t need to deliver something they simply recognised the mutual desire to make: you make something; I make something, let’s make something together. This highlights a theme that we have been exploring in Trash-2-Cash, that successful collaboration is as much about people getting on with one another, being inspired by each other - ‘clicking’ – as it is to do with systems, tools & methods. Hjalmar drew attention to the ‘demonstrator’ sample as a way of allowing others to see what is possible, while Kay reiterated a point made earlier about how research is intrinsically linked to teaching. Both researchers found that the complimentary skills and knowledge – described as ‘breadth and depth’ (referencing Tim Browns ‘T’ model), as well as identifying a shared problem, provided the basis for working together. Miriam Ribul (UAL) and Dr Hanna de la Motte’s (RISE) work was presented partially via Skype (a modern enabler of collaboration) and introduced Miriam’s past work for Mistra (where the collaboration was born) and her current Doctoral research. Miriam worked with Hanna as a ‘designer in residence’ which involved intense two week periods in the science lab. Miriam’s approach was playful and experimental: “she created so much cool stuff” Hanna explained; the serendipitous nature of design exploration within such a short space of time compared with the longer process of systematic scientific enquiry was a theme which was echoed by others throughout the day. The hardest thing was working out what they could do together, what was possible, how to start… while Miriam noted that one of the nicest things was being able to get a scientific explanation for what she had made the materials do through her experimentations. Dr Dawn Ellams (UAL) and Prof Robert Christie (Heriot-Watt University) explained how the challenging landscape of research assessment in the UK was part of the driving force behind creating ‘impact’ through research collaborations with designers. Top-down drivers were also identified later in the day as an opportunity for this type of research, as funders too increasingly understand the value of multidisciplinary research. Bob explained that one of the surprising things about Dawn was how she turned scientific concepts into inspiration for her work, while Dawn noted that she had to communicate her approach to the scientists in a way which gained their trust, learning about a specific part of the process whilst maintaining her unique standpoint as a designer, so as not to become a ‘bad scientist’. Bob repeatedly saw that through uninhibited exploration, his design students were able to make discoveries that scientific enquiry would be unlikely to predict: “I learnt not to discourage them”. Dr Adam Walker & Nick Ryan (Worn Again)represented an interesting contrast to the academic focus of the first four duos. Working in industry, the pair explained that while the first major challenge had been understanding one another (both explained that they had invested time to better understand the other’s language and discipline), the continuing problem has been communicating the value of a scientific principal to commercial stakeholders. Nick explained that a simple diagram had been the key to potential funders understanding why their technology would make money in a competitive environment, while Adam explained that the real advantage of working in this context was that the market was already established – market-pull is far more effective than technology-push. Dr Kate Goldsworthy hosted the panel discussion in the afternoon, drawing out some of the key questions from the morning’s talks. Some of the highlights were the ability of designers to ‘ask the right questions’, to challenge the scientists, and the need to work together in close proximity – do we need new spaces for design-science work? Creating an atmosphere for the freedom to explore, and reach serendipitous outcomes which may be more ‘innovative’ than conventional enquiry, how can we do this more in design and science? What can be achieved in science within one month and what can be achieved in design are very different, what can we expect from each discipline given the different timeframes? Investing in the other discipline while maintaining your own disciplinary identity also a featured in the discussion. What new (old) methods are useful? How do we creatively communicate? What new spaces could we share? This is part of TED’s ongoing research into multi- and inter- disciplinary tools and methods in both the Trash-2-Cash and Mistra Future Fashion II projects. Watch this space for more events, discussions and research from us in this emerging area. In November 2016, over 100 designers, researchers and scientists gathered at the Tate Britain in London to brainstorm the fashion industry's approach to the Circular Economy revolution. We've created a Storify, in the words of those who were there (through the lens of the Trash-2-Cash project). Go to Storify to read. ‘Cellulose Spaghetti’ is the latest Trash-2-Cash podcast, and the first to feature one of our science partners. Dr Michael Hummel is part of the Aalto Chem team working on chemically dissolving waste to produce new, high quality textile fibres. The Ioncell-F process they’ve developed won last year’s Global Change Award, and Michael explains more about the process, and potential impact in the podcast. Ioncell-F is a new method to create so-called ‘man-made cellulosic fibres’. These are meant to replace, or be an alternative to, cotton. There have been a few fibres on the market – most prominently Tencel and Viscose – but the problem with Viscose is that it’s connected to a lot of toxic chemicals, so the process is anything but green. The fibres are good (in the end), but the way to get to these fibres is not really in line with 21st century sustainability thinking. So there’s a need for new processes. The Tencel process is one of them, but it is limited…the process that we have come up with is more versatile, and that is reflected in the trash that we can transform into high quality fibres. The feedstock that we’re using to produce these fibres is cellulose…and it doesn’t really matter where it comes from – whether old cotton textiles, fresh wood pulp, or used cardboard boxes. As soon as we can isolate the cellulose, we can convert it. Cellulose is a polymer. Most people connect that term to synthetic polymers (or oil based products), but cellulose is a natural polymer - the most abundant natural polymer on earth in fact. In every biomass you’ll find cellulose – from a little in algae, to 90% or more in cotton. It’s an amazing resource that hasn’t been valorized yet. Michael goes on to talk about how you spin a solution into a fibre (a hint is in the title of the podcast), how colours and dyes affect the recycling process and he tells us what an ionic liquid is. Michael also explains how collaborating with designers has helped to move what might have been a small lab based project onto the global stage, with the chance to make a real impact on the lifecycle of all textiles. This is an insightful podcast that highlights why we need science, design and industry to come together to help solve real and urgent problems. Listen to Michael’s story on either Soundcloud or iTunes…and don’t forget to subscribe for more. In our latest podcast, Prof Becky Earley catches up with Matilda Laitila - an R&D Project Manager at cool Finnish Children’s brand Reima. For more than 70 years Reima has been supplying cosy clothing encouraging people to play outdoors, no matter the weather. Through projects like Trash-2-Cash Reima intends to continue being the world’s leading expert in outdoor clothing for children. It’s also important for T2C to have industry partners who are at the ‘coal face’ of performance wear, to make sure fibres we develop in the project will be commercially viable in that sector. Founded in 1944, there was a shortage of raw materials, so the first Reima products (women’s work wear) were manufactured out of old army snowsuits. As performance is such an important part of outdoor fashion design, there’s always been a focus on material breakthroughs at Reima – Enstex material was introduced, then followed by Reimatec. Matilda’s job is to study new materials that will help them meet their goals of a waterproof, abrasion resistant and comfortable garment. Reima also has pretty inspiring pillars of responsibility around sustainability, covering material and product development, the supply chain, and future recycling systems. Matilda talks about all of this in the latest Trash-2-Cash podcast, available on iTunes and Soundcloud now. This autumn (23 – 24 November) marks the introduction of the international conference, focusing on textile design and the circular economy. The conference coincides with the 6th T2C workshop and provides a unique opportunity for the first findings to be presented to a design audience. The contribution from Trash-2-Cash researchers demonstrates the diverse range of topics being investigated around the idea of ‘developing circular materials’. A sample box containing 112 textile samples (90 material types - 76 blends and 14 pure fibres) collected from 1 tonne of textile waste will be presented alongside key results from work package 4 of Trash-2-Cash. The exhibit shows the unique challenge of textile waste for textile recycler SOEX and also the great opportunity for regenerating cellulosic fibres from mixed cotton waste. Practising collaboration through making, Trash-2-Cash partners will be invited to co-create an upcycled shirt during workshop 6 which will then be exhibited within the Circular Transitions exhibition. Can Design-Driven Material Innovation also drive circularity? We all arrived with broad smiles and genuine embraces - the result of a year’s familiarity with each other. Although we anticipated there'd be difficult questions to answer over the two-day workshop, the atmosphere was warm and optimistic (something Skype calls rarely achieve). In the morning there were planned talks and activities, and a sharing of knowledge about T2C materials on a tour of R&D islands. In the heat of the afternoon, we started to explore our design islands. Navigating from materials R&D to new design concepts was tricky at first, it took a while for people to adjust to the unfamiliarity of design applications – and the journey could have been smoother. At the end of Day 1 it wasn’t clear if we had achieved everything we had intended; had the two areas of materials knowledge from science and design cross-pollinated or simply passed each other by? And some difficult questions about project direction remained unresolved. By contrast Day 2 was a dramatic voyage. We raised project direction issues in open and frank discussions, and there was uncomfortable uncertainty as partners discussed their contribution to solving the problems. Through some brilliant tools and mediation from our lead facilitator from Material ConneXion and the generous collaboration of all of the partners, indecision turned into commitments, and discomfort to excited optimism. As we fed back the previous day’s Design and R&D Island work to the whole group, we saw the project pulling together in a synchronicity that hadn’t existed before. The project materials lined up with the manufacturing capabilities and we could all see the kinds of products they could become. The joy after a truly intense two days was palpable: “This was the best workshop yet”. Even if at times it felt like we might at any moment become unstuck, the hard work of communication and collaboration definitely paid off. And the result? By workshop 06 in London we will have our first design concepts and our first Trash-2-Cash material samples. In our new podcast, Tina Mueller of Copenhagen Business School explains why the Intention-Behaviour gap is important in understanding consumer perceptions of recycled goods. To learn more about social marketing and sustainability research from the customer's perspective, go to iTunes or Soundcloud to listen. Don't forget to subscribe so you receive all new episodes automatically! Sometimes this means devising experimental workshop sessions, other times all that is needed is a conventional PowerPoint presentation or an open discussion. And then occasionally – to our great relief – a situation arises where we can repeat activities that we know have worked in previous T2C workshops (WS). WS05 in Copenhagen is based on one of these ‘tried and tested’ activities. Julie Hornix from design agency VanBerlo, recalled a session that Material Connexion had prepared for WS01 in Stockholm, back in September 2015 (timely that it's exactly one year later). In its first appearance the session was described as a marketplace with scientists each having a ‘stall’ to share the different fibre technologies they would develop in the project. Our methodology team recalled that it was a particularly effective and engaging way to share knowledge, introducing designers to the materials they would be helping to develop, using samples, videos and diagrams instead of scientific datasheets or dense papers. Right now, we are at a Milestone in the project where Fibre Prototype 1 has been produced and so, once again our materials scientists have significant new knowledge to share with all of the partners. Differently, this time, designers also have work to present: new design briefs and Concept Areas have been developed from all of our scenario work, and in Copenhagen our design and manufacturing partners will be choosing which Concept Areas they want to work on in more depth. This time instead of a marketplace we have decided that Islands are an appropriate place for interdisciplinary discovery: groups will visit each island in turn to unearth the newly formed gems of scientific endeavor and design ideas. On our Science Islands visitors will be able to see the first scientific results demonstrated through fibre samples with the best scientists in their field on hand to answer probing questions. On our Design Islands visitors will discover material and product samples showing cutting edge design in three different types of application. Leading textile and industrial designers will provoke, translate and ideate to develop Concept Areas through discussion. They will be on hand to respond to questions from the scientists and manufacturers about how these design visions align with technical material challenges. WS05 promises to be an exciting moment for all of the T2C partners: the methodology team get to use a repeatable workshop design; the scientists get to present their first results and glimpse the types of products their fibres could become; manufacturers can start to realise the types of textile structures and finishes that they will be able to test; designers will finally get something tangible and meaningful to work with: real materials and actual product concepts.